Each school year, we put on various productions that involve students enrolled in Drama as well as those apart of the Thespian Club on campus. Check out our calendar, and previous productions and events! 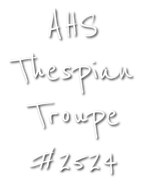 Thespian Club Meetings are every Thursday at Lunch in the Little Theater. We discuss our various productions and activities. We also vote on important decisions and fundraise for all of our shows! We have A LOT of money to fundraise in order to put on all of our amazing shows! These range from food fairs to selling holiday grams and working concessions at performances. Your help and support in this will ensure that the club and program continue going strong! Every year we put on an amazing haunted house! With a different theme each year, be sure to come to meetings to help us choose the perfectly terrifying way to scare everyone! This is our first play of the year and the cast is made up of students in Advanced Drama. Everyone will have the opportunity to help with hair, make-up, costumes, sets, lights, sound, concessions, and house management! Everyone is welcome to try out for the Spring Musical! All are welcome for all possible roles both on stage and off. This is the highlight of the year and our biggest production. Typically in the Fall and Spring. A showcase for Drama students to perform scenes and monologues that they have been working on in class. Once again, club members are encouraged to help with everything backstage and in front of the house! Each year, Advanced Drama Students will write, direct, and perform in original scenes. Club members are encouraged to help with everything backstage and in front of the house!